"Immeasurable Light" combines reconstructed ancient pipa melodies with Wu Man's own contemporary compositions. The seeds for this recording project were sewn 12 years ago when Wu Man first met University of Arkansas Professor of Ethnomusicology, Dr. Rembrandt F. Wolpert. One of Dr. Wolpert's areas of expertise is music manuscript scrolls discovered early in the 20th century in the Mogao Buddhist Caves in Dunhuang in the Gansu province of Central Asia that contained a set of 25 pieces notated in tablature for pipa (a lute-like stringed Chinese instrument). Another is lute versions of music dating from the Tang Dynasty (618-907) that had been preserved in Japan. "It took me years to think through how I could interpret the historical material and combine it with my own compositions in a way that would call up the ancient Chinese music spirits, and at the same time, allow the listener to discover a new, different pipa music," says Wu Man. For Dr. Wolpert, meeting Wu Man meant he could hear how this ancient tablature sounded for the first time. The tablature of these ancient manuscripts shows the finger-markings and how to play the notes, rather than the notes themselves. Dr. Wolpert describes the process of building new tunes from the ancient roots for "Immeasurable Light" as similar to an archeologist restoring artifacts. To this end, he and Wu Man adhered to Article 12 of the Venice Charter of the International Council on Monuments that states: "Replacements of missing parts must integrate harmoniously with the whole, but at the same time must be distinguishable from the original so that restoration does not falsify the artistic or historic evidence." Working together, they translated the ancient tablature to create base tunes, some existing of just a few notes. Wu Man then built upon these to create fuller tunes, with the aim of retaining the spirit of the original fragment. She also composed her own works for this recording. Although built around musical echoes from the past, all of the tunes on "Immeasurable Light" are newly created. "The old tunes and my own pieces are inspired by each other here, and hopefully in a small way this recording both preserves and extends the extraordinary pipa repertoire," she says. The 14 tracks demonstrate the pipa's extensive history, with melodies spanning from the 6th to 12th centuries to Buddhist mantras, centuries-old shadow puppetry scores and ancient dances. Wu Man was also inspired by her personal musical passions and partnerships. In addition to exploring and expanding the pipa repertoire, Wu Man also experimented with the pipa's sonic capabilities on this recording. 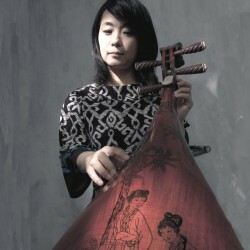 Techniques she used included: layering multiple pipa tracks; bowed pipa; "prepared" pipa (inspired by John Cage's prepared pianos, she attached paper plates, paper clips and pencils to the strings to simulate the sound of a temple bell); using special effects on the pipa to imitate the sound of the Chinese Qin, an ancient seven-string zither; and playing two pipas on one track with the instruments set to higher and lower octaves. Wu Man performed all the pipa parts on the recording and also performed percussion and vocals on various tracks. On two tracks, The Round Sun and Crescent Moon in the Sky and Namu Amida (Homage to the Buddha of Immeasurable Light), Wu Man is joined by her frequent collaborators, the Kronos Quartet. The first track, arranged by Jacob Garchik, is a joyful rendition of a wild ancient folk song taken from the shadow puppetry repertoire of the northern region, while the second track is based on the Buddhist mantra, Namu Amida, which is itself set to the melody of Birds of the Qin River, a piece that dates from the Sui Dynasty (580-618). Wu Man says her recent collaboration with the Kronos Quartet on the multimedia work A Chinese Home and also her experience curating concerts of Chinese folk music for Carnegie Hall's 2009 Ancient Paths, Modern Voices festival celebrating Chinese culture, made it the right time to record this album: "My explorations into discovering the rich tradition of Chinese folk music and presenting this music in a modern context at Carnegie Hall really sparked my curiosity for working with these ancient notations and building tunes around these remnants. A Chinese Home was also a project that was inspired by the past and that examined musical traditions, and both of these performance projects have been musically enriching for me and very personally rewarding. They both helped me to shape this recording."